Many marine and aquatic human activities generate underwater noise and can have potentially adverse effects on the underwater acoustical environment. For instance, loud sounds can affect the migratory or other behavioral patterns of marine mammals  and fish . Additionally, if the noise is loud enough, it could potentially have physically damaging effects on these animals as well. Examples of human activities that that can generate such noise are offshore wind farm installation and operation; bridge and dock construction near rivers, lakes, or ports; offshore seismic surveying for oil and gas exploration, as well as oil and gas production; and noise in busy commercial shipping lanes near environmentally sensitive areas, among others. All of these activities can generate noise over a broad range of frequencies, but the loudest components of the noise are typically at low frequencies, between 10 Hz and about 1000 Hz, and these frequencies overlap with the hearing ranges of many aquatic life forms. We seek to reduce the level of sound radiated by these noise sources to minimize their impact on the underwater environment where needed. A traditional noise control approach is to place some type of barrier around the noise source. To be effective at low frequencies, the barrier would have to be significantly larger than the noise source itself and more dense than the water, making it impractical in most cases. 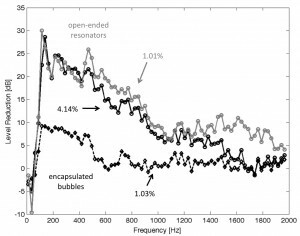 In underwater noise abatement, curtains of small freely rising bubbles are often used in an attempt to reduce the noise; however, these bubbles are often ineffective at the low frequencies at which the loudest components of the noise occur. We developed a new type of underwater air-filled acoustic resonator that is very effective at attenuating underwater noise at low frequencies. 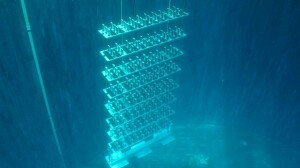 The resonators consist of underwater inverted air-filled cavities with combinations of rigid and elastic wall members. They are intended to be fastened to a framework to form a stationary array surrounding an underwater noise source, such as the ones previously mentioned, or to protect a receiving area from outside noise. The key idea behind our approach is that our air-filled resonator in water behaves like a mass on a spring, and hence it vibrates in response to an excitation. A good example of this occurring in the real world is when you blow over the top of an empty bottle and it makes a tone. The specific tone it makes is related to three things: the volume of the bottle, the length of its neck, and the size of the opening. In this case, a passing acoustic wave excites the resonator into a volumetric oscillation. The air inside the resonator acts as a spring and the water the air displaces when it is resonating acts as a mass. Like a mass on a spring, a resonator in water has a resonance frequency of oscillation, which is inversely proportional to its size and proportional to its depth in the water. At its resonance frequency, energy is removed from the passing sound wave and converted into heat through compression of the air inside the resonator, causing attenuation of the acoustic wave. A portion of the acoustic energy incident upon an array of resonators is also reflected back toward the sound source, which reduces the level of the acoustic wave that continues past the resonator array. The resonators are designed to reduce noise at a predetermined range of frequencies that is coincident with the loudest noise generated by any specific noise source. Underwater photograph of a panel array of air-filled resonators attached to a framework. The individual resonators are about 8 cm across, 15 cm tall, and open on the bottom. The entire framework is about 250 cm wide and about 800 cm tall. We investigated the acoustic properties of the resonators in a set of laboratory and field experiments. Lab measurements were made to determine the properties of individual resonators, such as their resonance frequencies and their effectiveness in damping out sound. These lab measurements were used to iterate the design of the resonators so they would have optimal acoustic performance at the desired noise frequencies. Initially, we targeted a resonance frequency of 100 Hz—the loudest components of the noise from activities like marine pile driving for offshore wind farm construction are between 100 Hz and 300 Hz. We then constructed a large number of resonators so we could make arrays like the panel shown in the photograph. Three or four such panels could be used to surround a noise source like an offshore wind turbine foundation or to protect an ecologically sensitive area. The noise reduction efficacy of various resonator arrays were tested in a number of locations, including a large water tank at the University of Texas at Austin and an open water test facility also operated by the University of Texas in Lake Travis, a fresh water lake near Austin, TX. Results from the Lake Travis tests are shown in the graph of sound reduction versus frequency. We used two types of resonator—fully enclosed ones called encapsulated bubbles and open-ended ones (like the ones shown in the photograph). The number or total volume of resonators used in the array was also varied. Here, we express the resonator air volume as a percentage relative to the total volume of the array framework. Notice, our percentages are very small so we don’t need to use much air. For a fixed percentage of volume, the open-ended resonators provide up to 20 dB more noise reduction than the fully encapsulated resonators. The reader should note that noise reduction of 10 dB means the noise levels were reduced by a factor of three. A 30 dB reduction is equivalent to the noise be quieted by a factor of about 32. Because of the improved noise reduction performance of the open-ended resonators, we are currently testing this type of resonator at offshore wind farm installations in the North Sea, where government regulations require some type of noise abatement to be used to protect the underwater acoustic environment. 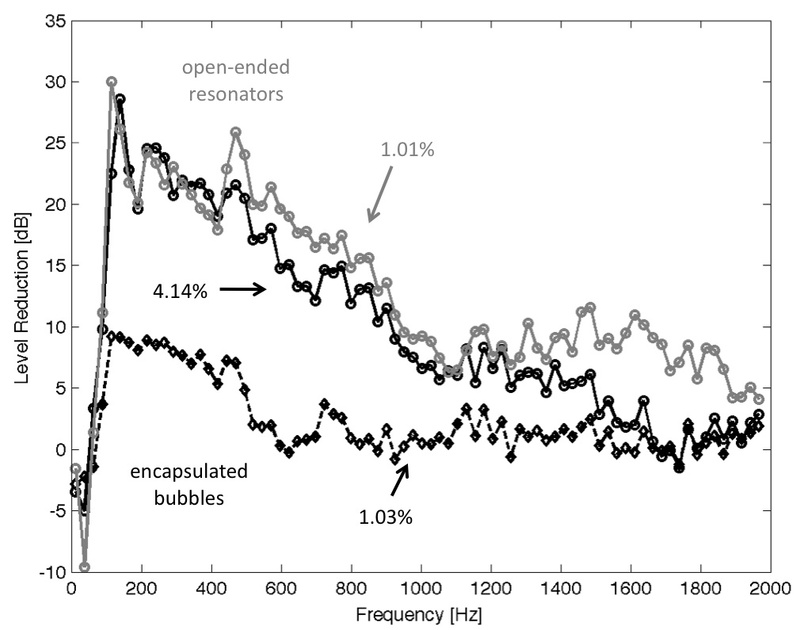 Sound level reduction results from an open water experiment in a fresh water lake. Various types of air-filled resonators were tested including fully encapsulated resonator and open-ended resonators like the ones shown in the photograph. Because a much total volume (expressed as a percentage here) is needed, the open-ended resonators are much more efficient at reducing underwater noise. W. John Richardson, Charles R. Greene, Jr., Charles I. Malme, and Denis H. Thomson, Marine Mammals and Noise (Academic Press, San Diego, 1998). Arthur Popper and Anthony Hawkins (eds. ), The Effects of Noise on Aquatic Life, Advances in Experimental Medicine and Biology, vol. 730, (Springer, 2012).